Scott Salvator and Michael Zabriskie win accolades for their businesslike manner, personable natures and updated formal style. 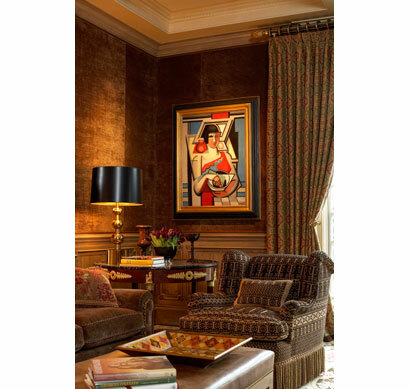 Clients also praise the firm for its strong use of color and intricate layering of fabrics and coordinated trims, saying that it constructs the ultimate “traditional, but not stuffy” home. Modern art and glass mosaics sometimes infiltrate the look, as does the occasional flatscreen TV, but the result is consistently one of serious design intent. Salvator is considered to be accommodating, detail-oriented, deeply tied to his work, intense, smart, practical and fun. Salvator received a BS in accounting and a JD in law, then studied interior design at FIT and Parsons. Before starting his firm in 1992, he worked for Mario Buatta, Gary Crain and Robert Metzger. Zabriskie, an associate at the firm, graduated from Parsons and worked with Mario Buatta, McMillen, and Parish-Hadley. The duo’s technical competence is often mentioned as a key differentiating strength. After the apartment on Park or Fifth is done, clients often hire the firm for a second home, done with printed linens, hooked rugs, and fewer tassels and trims. Homeowners interface directly with Salvator or Zabriskie, who do all the shopping themselves and “work eighteen hour days.” The back office of four is known for its strong follow-up. The firm asks for a standard design fee that is deductible against future purchases. Products are marked up at classic retail. Though the firm enjoys high-end product, references say “they were not snobs about it when we purchased some items at Home Expo.” Said to offer a highly personalized result that is “clearly not off the rack,” Salvator’s firm evokes a strong reaction from clients, with most becoming lifelong devotees and a few that just don’t click.